I have been stealing some time away from having to put sleeves on my quilts and making progress on my uanduqal blocks. When I made first few, I wasn't sure where this was going to go or if I will be able to stick with it. I don't usually do foundation piecing. 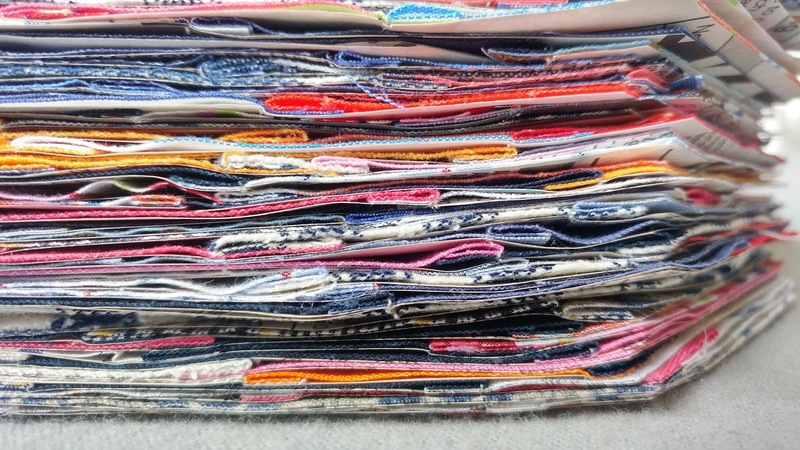 I like to just cut my fabrics and sew but this is a different kind of quilts and it required the good old phone book, and lots of little pieces from shirts and few solids. Every morning I make a few and later in the evening when time permits, I have been trimming them. It has gone pretty well so far. It took no time to fill this design wall up. I am working with 9"X 9" blocks so you can see how small this design wall is. It is good to see them on the wall though, it gave me an idea on which direction to go. It is mindless sewing but I am mindful about picking my colors and textures next to each other. Just because a quilt is scrappy, doesn't mean I let go of my need to design. Once I ran out of space, I decided to just have fun arranging them in a beehive pattern. Oh dear! 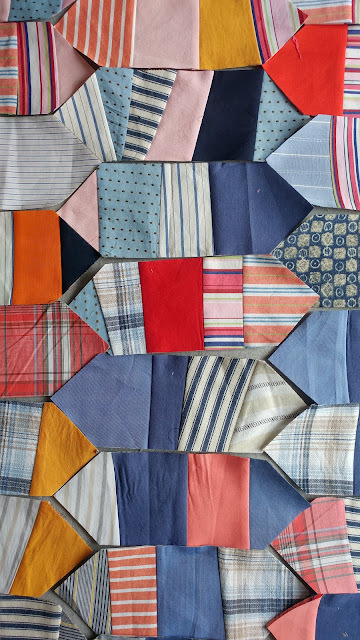 There is another idea for a quilt! 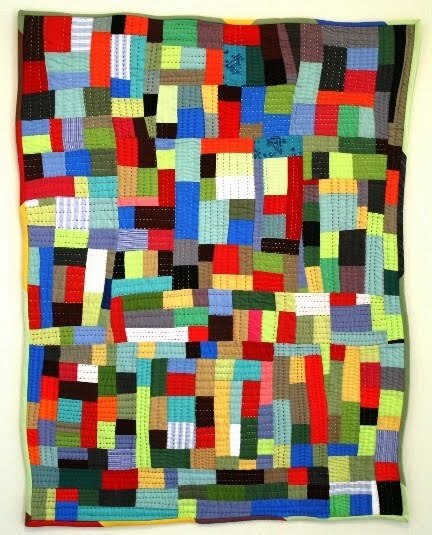 I am telling you I could devote this entire year for the quilts inspired from U and U! It is that good! 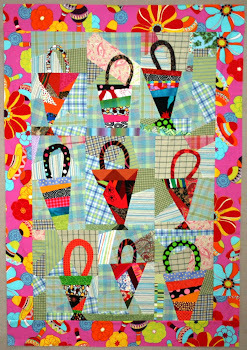 As you know, initially I had decided not to work with Y seams but it will be a great quilt if I can pull it off. 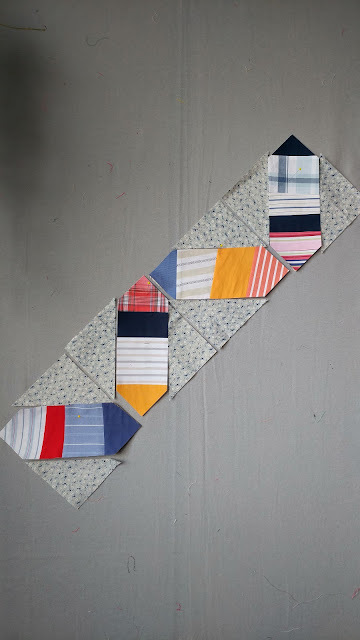 For those of you, who might want to stay away from those painful seams, there is another way of working with squares. Isn't this exciting? The more I look at the pattern better it gets! So how would you avoid the Y seams? It's simple. Make your blocks square! This is for a nine inch finished block. I would simply add setting triangles on either side. I cut mine at 5 inches and then cut once diagonally to finish the square. 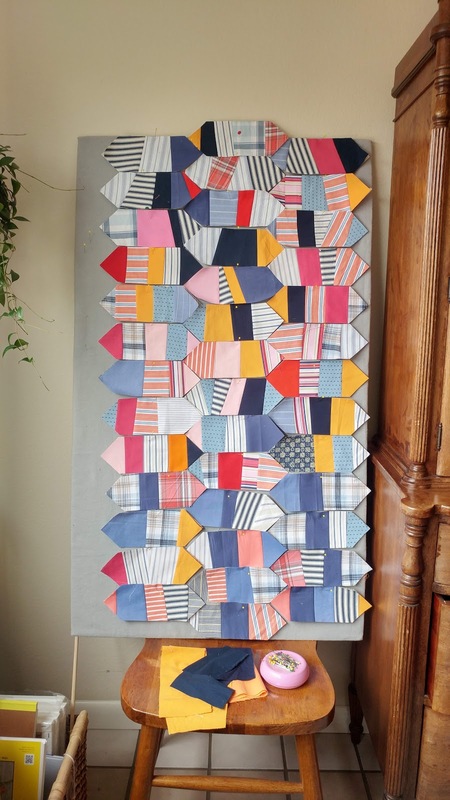 Yes, you will see that seam in the middle but if you use solid fabric it won't show after quilting and if you use prints, oh what better than add more texture to the quilt? 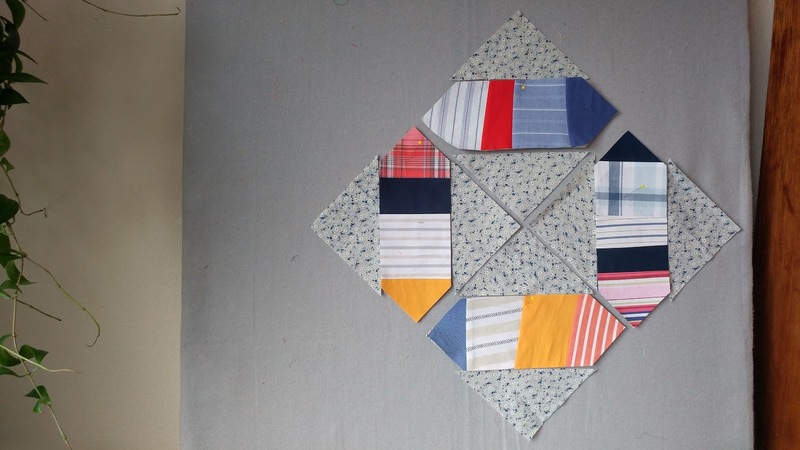 Once your square blocks are done, you will simply use the diagonal setting and set the blocks on point to finish the quilt top. You will need setting triangles at the end to finish the edges. So those of you who are struggling with quarter Square triangles not working, you can still use these blocks and make them look like continuous octagon shape. I have made a little stack here and I plan to continue. I hope all of you who are in deep freeze weather are staying warm. The version I am making does indeed use the split HSTs on either side of the scrappy center segment -- seems we both came up with that idea to avoid the Y seams and speed our progress. 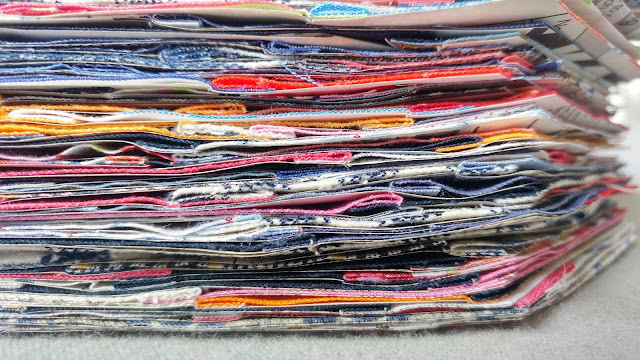 I agree about spending the whole year on UandU quilts. I have several in the wings - we'll see how many I actually have time to work on. You're definitely having fun playing with this block and coming up with different ways of using the parts and showing different pattern ideas. Thank you for this advice. I shall maybe get to this, but so far this challenge has got me practising (and improving) Y-seams. What problems have been happening with quarter-square triangle corners? I haven't seen any comments about that. In the deep freeze, but it is supposed to warm next week. It is -1 now. 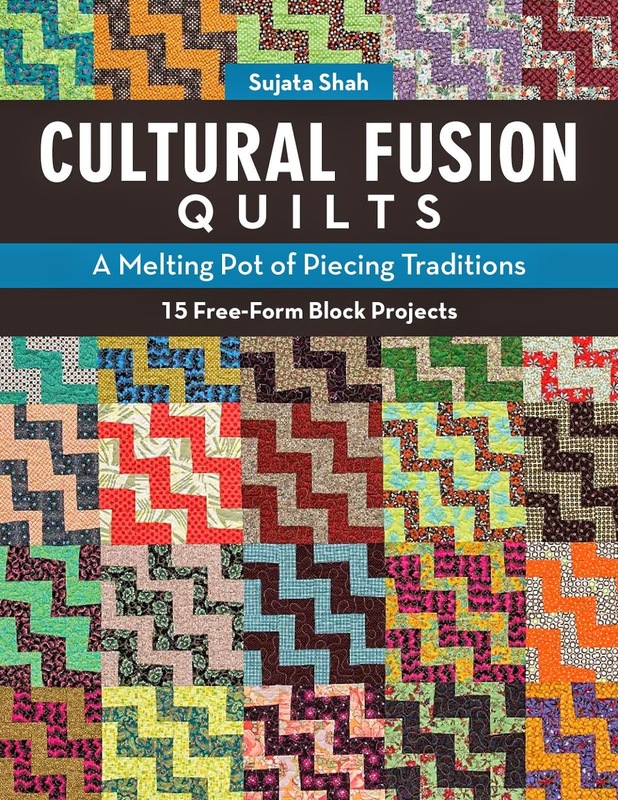 I am still having a hard time choosing which quilt to try. Don't you love how ideas come pouring out as we work through a design? 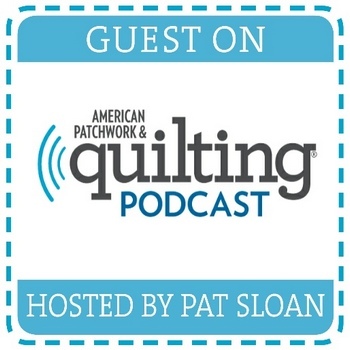 So many ways to address the cutting and sewing. And then changing the design. I very much like your scrap choices. It's looking good. isn't it amazing how limitless an idea can be once you get started! Hello! I love where this is going! I especially love your fabric choices/color scheme, so pleasing. Can you describe your portable design wall? Felt covered foam core, or? I have several projects going and I need more design space. Thanks for the inspiration! I recently saw your post regarding this QAL. Is it still possible to join ? 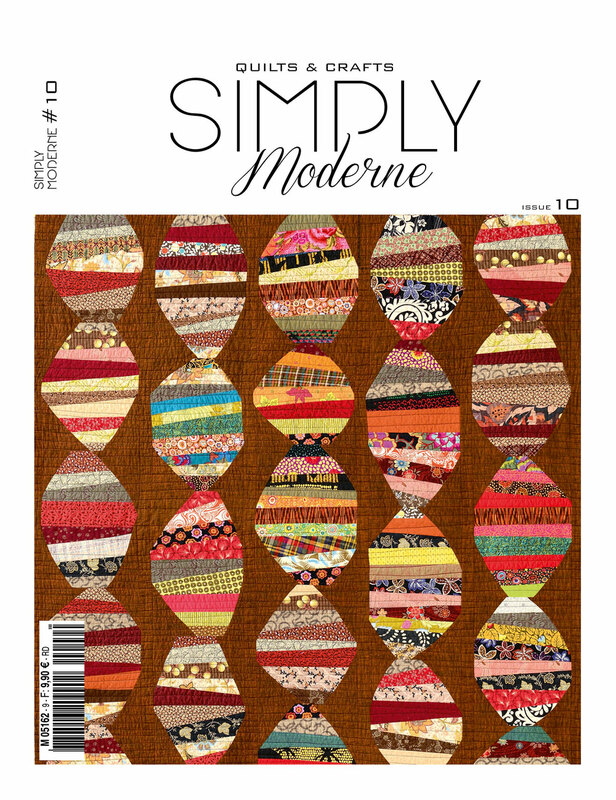 I just love the pattern & have ordered the book it is featured in. Oh oh oh! I’m on vacation in Key West and taking time to get inspired. But with other people, no fabric or supplies. Must wait til I get home. With your additional triangles that will be SO much easier! Thank you for that wonderful idea! Today we are finally getting snow this year, began around 10 am. Last time I made a snow person, she was tiny and I used a pansy blossom for her hat! Don't have any pansy's now. I really like the fabric you have chosen for this quilt, and the idea of turning these into squares are fabulous! 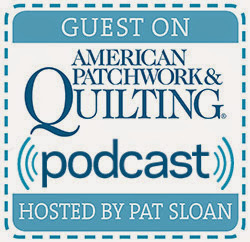 If there is a way to eliminate y seams, I am all for that! 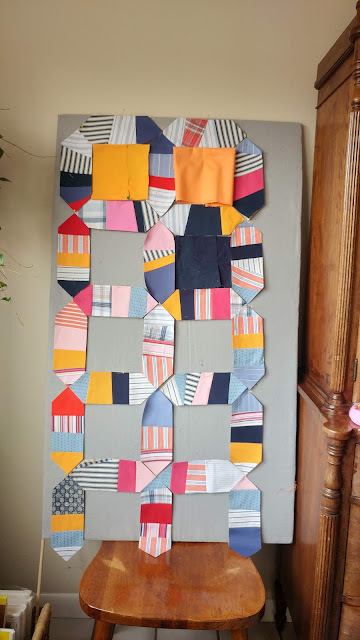 Love how your quilt is evolving, I haven't made much progress on mine yet, I'm still persevering with the QSTs, I have a bit of a plan worked out, just need some time to experiment with it. It's looking great! What a brilliant solution to making these blocks. 82 here in Florida! Paper Piecing also after a kayak paddle on Shingle Creek. Love those blocks! I even like them with the gray, design wall background. Very modern but not full-on “Sujata” !